When I was reviewing the Laowa 15mm f/4 super wide angle macro lens, I was quite impressed by how the company like to try something new and delivers something different to the customers. This time, I’m reviewing their new Laowa Compact Dreamer 7.5mm f/2 lens for micro four thirds cameras. The Laowa C-Dreamer 7.5mm f/2 lens gives you 15mm equivalent focal length for a 35mm full frame camera. The view angle is about 110° or in other words, it’s pretty much as wide as you can go for a non-fish eye lens. In case you are wondering, “C-Dreamer” stands for “Compact-Dreamer”. The review sample I received is from their first batch of production and the lens comes in a small, simple but nicely designed packaging box. The lens comes with the front and rear lens cap, a reversible lens hood and an english instruction manual. Nothing too fancy but at least they didn’t want you to pay extra for the lens hood. When I opened the box the first time, I immediately said to myself, damn it’s a really small lens! One of the biggest advantage of the micro four thirds system is that the lenses are quite small and easy to carry. So I wasn’t expecting the Laowa 7.5mm f/2 to be a huge lens. But for a ultra wide angle f/2 lens, i was expecting something of a reasonable size. Check out the photo below, it’s literally just a tiny bit taller than a Lego minifigure! You can fit it in any small jacket pocket very easily. The lens is made of metal and feel very solid. It is a manual focus lens and the aperture ring (clicked) and zoom ring are smooth and easy to operate. The position of the two rings are quite far apart so unlike some of the Mitakon lenses I have used before, I didn’t have any issues moving the wrong ring when taking photos. The aperture ring is 1 stop per click, feels very nice but can’t be de-clicked. Good for photographer but videographers might prefer a declicked version. The focus ring travel is about 90 degree which is a bit shorter than most manual focus lens. But since it’s an ultra wide angle lens, I didn’t find the short focus ring travel an issue at all in real life. The manual focus ring has hard stop at the limit just like pretty much all the manual focus lens and it doesn’t focus beyond infinity. However, the marking on the lens at the infinity setting is actually slightly beyond infinity so you have to be careful and can’t completely rely on the markings on the lens when you are focusing. It’s a minor thing but also an easy thing that Laowa should have fixed which would definitely improve the overall polish of the product. Now there is something that has been puzzling me for a while. I’ve reviewed quite a lot of lenses from various Chinese lens manufacturers recently. A lot of them have excellent optical performance and also good build quality and innovative design. But there is one thing, one little thing, a lot of them can’t seem to get it right. It’s really quite a minor and simple thing, so I’m not sure why. I’m talking about the lens hood and lens cap design. If you have use a Nikon or Sigma lens for example, you will find that the lens cap and lens hood can be attached and removed easily and independently. The lens hood won’t interfere the lens cap and vice versa. But if you have used some of the latest lens from China, quite often you’ll find the lens hood is quite hard to attach or remove. And if you have a lens cap attached on the lens, it would make it quite hard to remove the lens hood. Laowa 7.5 f/2 has similar issue as well. It’s not the worse, it’s already better than say the Kerlee 35mm f/1.2 lens, but putting the lens cap on or off the Laowa 7.5mm f/2 is still not the easiest thing to do in the world. But apart from that, the Laowa 7.5mm f/2 is a very well made and solid lens. And while it’s made of metal, the lens is only 170g so it takes up virtually no space and weight if you want to in your camera bag. There is also a light weight version for aerial photography which is 20g lighter (i.e. 150g) and $20USD more expensive. Basically you are paying one US dollar for each gram of weight reduction. If you are not going to attach the lens to a drone and fly it up the sky, it’s probably not worth the extra price as the two versions are supposed to be identical otherwise. The lens doesn’t have any electronic contacts and components inside. So you’ll have no EXIF, no optical image stabliser, no auto stopdown. Let’s talk about the image quality, I can only say I’m impressed. So start with the sharpness first. The Laowa 7.5mm f/2 is a really sharp lens, even at it’s maximum aperture. Centre sharpness is really good from f/2 already and surprisingly, even the corners are also very sharp at f/2. Stop it down to f/2.8 would increase the sharpness a bit more but frankly I would be happy if I have to take photos at f/2. I also didn’t notice any field curvature issue at least at infinity focus distance setting. Below are some 100% crop photos comparing the Laowa with the Panasonic 7-14 and Leica 8-18. As you can see, the Laowa is a very sharp lens, both the centre and the corner. I wasn’t really expecting the corner sharpness to be so good at f/2 as most fast prime lenses has average or poor corner sharpness, so it’s a bit of surprise, but a pleasant surprise. The pictures from Laowa has slightly lower contrast overall, I believe it’s largely due to the sun was in front of the camera and that caused a little bit more flare on the Laowa which I’ll talk about later. Stop down to f/2.8 or f/4 would improve the sharpness a bit more, but frankly I would be perfectly happy to shoot at f/2 if I’m shooting without a tripod under low light. Of course the Laowa is a prime lens while the other two are zoom lenses so this means Laowa can be made sharper easier. But consider the Laowa is also quite a bit cheaper in price and smaller, it is definitely a very good choice if you are looking for a sharp ultra wide angle lens. In terms of geometric distortion, it’s pretty much as good as, if not slightly better than Panasonic and Olympus’s ultra wide angle zoom at the wide end. But as the Laowa is a prime lens, I kind of hope it to have even better distortion control. You can see some distortion when you are shooting scenes with long straight hard edges. Chromatic aberration is very well controlled. I took a lot of high contrast photos at maximum aperture. And I don’t really see too much colour fringing at all. Even when I zoom in at 100%, there is very little colour fringing. Once again, I’m really surprised. I thought I would see some ugly purple and green fringing especially near the edges but I don’t see much in all my photos. Have a look at my sample photos, I don’t remove colour fringing in my normal RAW conversion / post processing workflow and you can see how little chromatic aberration the Laowa creates. Laowa 7.5mm f/2’s chromatic aberration control is fantastic. Vignetting is noticeable at f/2 and f/2.8. It becomes much better from f/4 onwards. For most real life photos, the amount of vignetting probably won’t affect your photo much, but if your photo has a very plain background, then stop down to f/4 and keep vignetting to almost undetectable level. With it’s ultra wide angle and large aperture, I imagine quite a lot of people would want to use the Laowa for astro photography. I didn’t have a chance to go out in the middle of the night to take some photos of the milky way, but my fake astro photography photos (i.e. photos of far away point light source) show me that the Laowa does have quite a bit of coma at f/2. Stop it down to f/2.8 would improve it but if you really want to minimise coma, you will have to shoot at f/4. Photos taken at f/2 is still useable, but I would avoid placing a lot of stars near the edges of the frame. The biggest weakest for the Laowa 7.5mm f/2 is it’s flare resistance performance. If you are someone like me who like to shoot into the sun and shoot a lot of backlit scenes, then be prepared you will see quite a bit of flare and ghosting in your image or video. While I won’t say it’s really bad, it’s definitely not as good as the best lenses like the Leica 8-18mm f/2.8-4 that I reviewed recently. 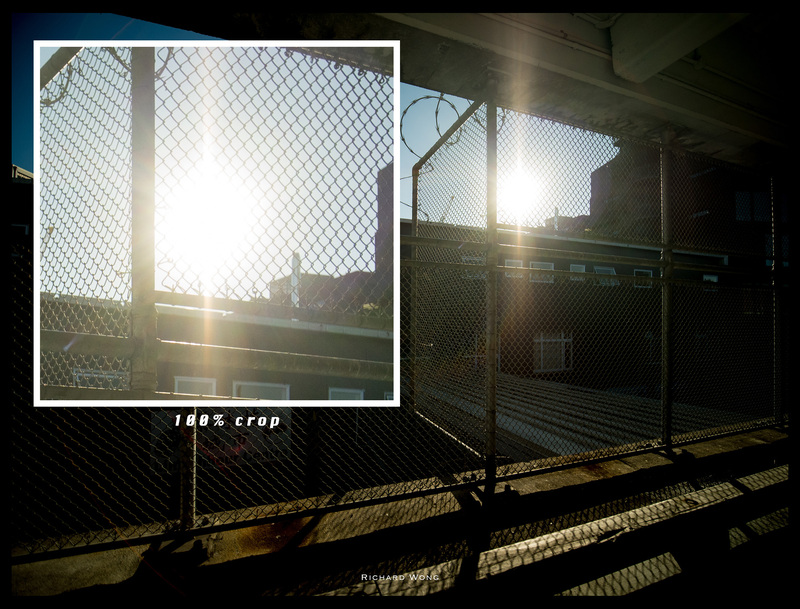 Leica’s nano coating seems to be a lot more effective in minimising lens flare. Having said that, I have used a lot other lenses that have much worst flare issue than the Laowa. So the Loawa definitely isn’t terrible. If I could pick one thing I can improve on this lens, it would be it’s coating/lens resistance. There are a lot of things to like about the Laowa Compact Dreamer 7.5mm f/2 lens. The overall image quality is excellent. The superb sharpness and virtually lack of colour fringing can easily make you forget about the less than perfect flare and vignetting performance. The lack of auto stop down aperture isn’t really an issue for mirrorless cameras and manual focus shouldn’t really be a problem either for an ultra wide angle lens as well. Build quality is great, the lens feels very solid and well made when you hold it in your hand. The best thing about this lens is that it’s so small and light, you should be happy to just leave it in your camera bag all the time even when you are not planning to use it. No matter you are a photographer or videographer, you should really check out this lens. Richard is a multi-award winning wedding/portrait photographer based in Auckland, New Zealand. I love photography, love playing with latest (and also old) cameras. I shoot with digital, film cameras and also smartphone.